Theseus, the great national hero of Athens, is said to have been born at Troezen, where his father, AEgeus, King of Athens, slept one night with AEthra, the daughter of Pittheus, king of the place. AEgeus, on his departure, hid his sword and his shoes under a large stone, and charged AEthra, if she brought forth a son, to send him to Athens with these tokens, as soon as he was able to roll away the stone. She brought forth a son, to whom she gave the name of Theseus, and when he was grown up informed him of his origin, and told him to take up the tokens and sail to Athens, for the roads were infested by robbers and monsters. But Theseus, who was desirous of emulating the glory of Hercules, refused to go by sea, and after destroying various monsters who had been the terror of the country, arrived in safety at Athens. Here he was joyfully recognized by AEgeus, but with difficulty escaped destruction from Media and the Pallantids, the sons and grandsons of Pallas, the brother of AEgeus. These dangers, however, he finally surmounted, and slew the Pallantids in battle. His next exploit was the destruction of the great Marathonian bull, which ravaged the neighboring country; and shortly after he resolved to deliver the Athenians from the tribute that they were obliged to pay to Minos, King of Crete. Every ninth year the Athenians had to send seven young men and as many virgins to Crete, to be devoured by the Minotaur in the Labyrinth. Theseus volunteered to go as one of the victims, and through the assistance of Ariadne, the daughter of Minos, who became enamoured of him, he slew the Minotaur and escaped from the Labyrinth. 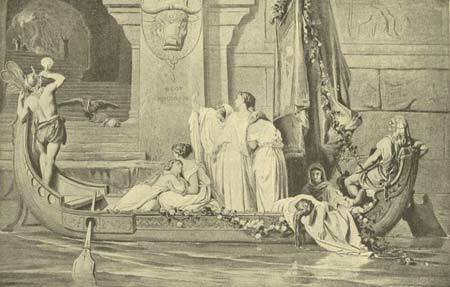 He then sailed away with Ariadne, whom he deserted in the island of Dia or Naxos, an event which frequently forms the subject of ancient works of art. The sails of the ship Theseus left Athens in were black, but he promised his father, if he returned in safety, to hoist white sails. This, however, he neglected to do, and AEgeus, seeing the ship draw near with black sails, supposed that his son had perished, and threw himself from a rock. Theseus now ascended the throne of Athens. But his adventures were by no means concluded. He marched into the country of the Amazons, who dwelt on the Thermodon, according to some accounts, in the company of Hercules, and carried away their queen, Antiope. The Amazons in revenge invaded Attica, and were with difficulty defeated by the Athenians. This battle was one of the favorite subjects of the ancient artists, and is commemorated in several works of art that are still extant. 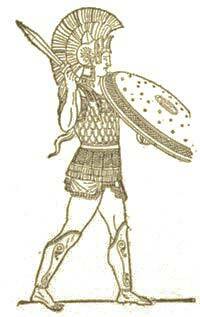 Theseus also took part in the Argonautic expedition and the Calydonian hunt. He assisted his friend Pirithous and the Lapithae in their contest with the Centaurs, and also accompanied the former in his descent to the lower world to carry off Proserpine, the wife of Pluto. When Theseus was fifty years old, according to tradition, he carried off Helen, the daughter of Leda, who was then only nine years of age. But his territory was invaded in consequence by Castor and Pollux, the brothers of Leda; his own people rose against him, and at last, finding his affairs desperate, he withdrew to the island of Scyros, and there perished, either by a fall from the cliffs or through the treachery of Lycomedes, the king of the island. For a long time his memory was forgotten by the Athenians, but he was subsequently honored by them as the greatest of their heroes. At the battle of Marathon they thought they saw him armed and bearing down upon the barbarians, and after the conclusion of the Persian war his bones were discovered at Scyros by Cimon, who conveyed them to Athens where they were received with great pomp and deposited in a temple built to his honor. A festival also was instituted, which was celebrated on the eighth day of every month, but more especially on the eighth of Pyanipsion. The above is a brief account of the legends prevailing respecting Theseus. But he is, moreover, represented by ancient writers as the founder of the Attic commonwealth, and even of its democratic institutions. It would be waste of time to inquire whether there was an historical personage of this name who actually introduced the political changes ascribed to him; it will be convenient to adhere to the ancient account in describing them as the work of Theseus. Before this time Attica contained many independent townships, which were only nominally united. Theseus incorporated the people into one state, removed the principal courts for the administration of justice to Athens, and greatly enlarged the city, which had hitherto covered little more than the rock which afterward formed the citadel. To cement their union he instituted several festivals, and especially changed the Athenaea into the Panathenaea, or the festivals of all the Atticans. He encouraged the nobles to reside at Athens, and surrendered a part of his kingly prerogatives to them; for which reason he is perhaps represented as the founder of the Athenian democracy, although the government which he established was, and continued to be long after him, strictly aristocratic.